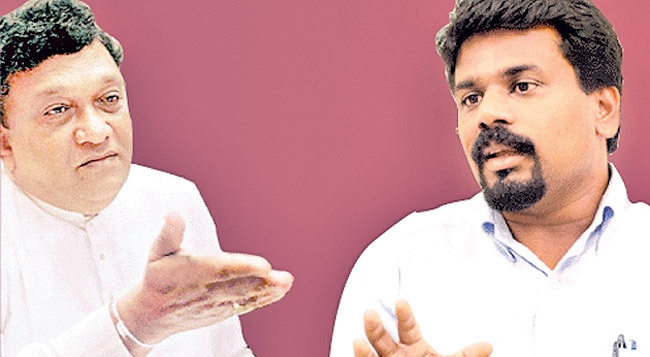 Leader of the House and Minister Lakshman Kiriella and Chief Opposition Whip and JVP Leader Anura Kumara Dissanayake locked horns in Parliament yesterday over the COPE investigations on Central Bank Treasury Bonds controversy. A heated argument occurred between them when MP Dissanayake wrapped up his speech during the debate on Right to Information Bill. Kiriella, making a clarification on Dissanayake’s revelation on COPE findings on Public Relations Officers and Advisors to the Minister, said during the period of 2005-2015 there had been 190 such people appointed for the Ministry by his predecessors. “The investigations are not being held over these acts of the previous Government. The COPE is probing the present matters, but not the previous ones. It should follow the sequence,” he said. Commenting further he said, “Now you talk about the matters before the COPE in Parliament and at press conferences. Is this correct? Then COPE decisions could be invalid. You said COPE Chairman Sunil Handunnetti held a press conference on Arjuna Mahendran”. MP Dissanayake pointed out the said press conference was held long before Handunnetti’s appointment to the COPE. He added the press conference was held even before the lapse of one week after the controversial Treasury Bonds deal. “If you are going to chair a Committee with a preconceived opinion, will it be fair? It is up to you to do it the way you want, I am just giving you an opinion,” Kiriella continued. At this point, Dissanayake fuming at Kiriella said, “If you want to sit at the COPE and hear the cases, do it. If you want to appoint one of your members as the COPE chairman, do it. If somebody is telling Handunneti is unfit to hold the COPE chairmanship based on that press conference he held a long time ago, we are ready to step down from that position. We need not to hold it by force”. Kiriella intervening at this point said Dissanayake had misinterpreted what he said. “You came up with an opinion. What do you propose in this regard, if not the resignation of COPE Chairman?” asked Dissanayake. “We have nothing to hide. We willingly offered the post to the JVP. I will place my argument to a person who can understand” replied Kiriella.